When my two daughters were in the same middle school gym period, their teacher once asked them to stop hugging during class. Born twenty-one months apart, now both in high school, they are honest-to-goodness friends. Because they often walk arm in arm (and hug!) in public, people often ask me if they always get along so well. Truthfully, they do – most of the time. They have their disagreements, but they sincerely like each other. They are sisters who are friends in a world where the expectation is that siblings will bicker and fight. At least until a mysterious shift happens in adulthood and they learn to appreciate one another. 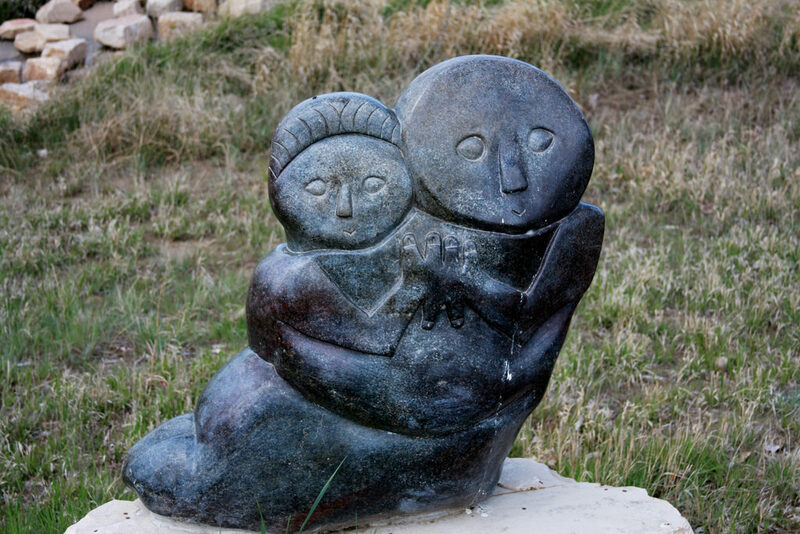 Comforting Sisters sculpture by Elwans Chemapako (b. 1952). Photo credit: William Andrus. Used under a Creative Commons license (CC-BY-2.0). Like many siblings, my girls have very different personalities. One loves shopping and the other would spend all her free time in her favorite tree. One prefers beaches, the other mountains. 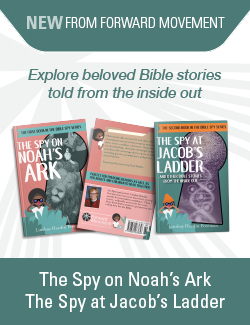 When they were toddlers dropping toys off the high chair over and over again, we realized that we could not force or guilt our children into being anyone other than who God made them to be. Instead of trying to change their personalities, we celebrate their passions, gifts, and talents with the expectation that they use them for good in our family and the world. We remind them frequently that they are wonderfully made in the image of God. Many of our dinner table conversations are about our hopes for peace and justice in the world. We have empowered them to use their unique identities to participate in God’s vision of “earth as it is in heaven.” They have grown to see their differences, and the differences of others, as beautiful gifts. True story. Even when it means spending 30 minutes trying to figure out who had the green cup first. Whenever our girls get into a fight, we take the time to teach them to listen to the other side, identify the point of conflict, and propose solutions. We absolutely do not allow hitting or any form of physical harm. As parents, we model owning our own mistakes and apologizing for them. I confess, working through conflict is exhausting. I have gained a new appreciation for my own parents’ approach to conflict management (which relied a lot on the phrase, “just stop fighting!”). But, each time I am tempted to shut my kids’ argument down, I remember my own childhood frustration at not being able to share my side of the story. Teaching children to work through arguments with love is tedious, but worth it. Our entire family experiences the fruits of kindness, love, peace, patience, goodness, gentleness, and self-control (especially me) when we work through disagreements. In listening to the other’s perspective, we gain deeper compassion and a sense of justice. Dinner, homework, carpool, bedtime, weekends, vacations, attending church, and volunteering are just some of the opportunities we take to be together. We look forward to all of it – the everyday conversations, the challenges, and new adventures. My husband and I place a high value on family time because we know that this is where our kids see our faith and lives in action. It is also the time that they learn, mostly vicariously, who and whose they are. We speak openly with our girls about the joys and hardships of life. They have seen first-hand how we’ve dealt with lost jobs and difficult relationships. They have been a part of our joy and gratitude for the abundant blessings of life. Despite our many doubts and questions, our family values are grounded in the idea that God is loving, good, and present through all that life brings. While my girls came up with a strong list of parenting principles that encouraged their genuine friendship, I think they left an important one out: humility. There are no 8 step programs that guarantee siblings will be friends. It is entirely possible that this piece will publish on the day our kids start one of those seemingly endless spells where no one is getting along, doors are slamming, and I am constantly reminding them about their tone. My husband and I never want to give our children, or anyone, the illusion that we’ve got it all figured out. The only thing I know for certain is that an abundance of humor, love, patience, and grace are essential ingredients for parenting the children entrusted to us. Are you friends with your siblings? How did your friendship grow? This really touched me as my kids also hug all the time and people are always surprised how close they are. They also bicker and play too rough sometimes but they choose each other over other friends. My husband and I are close with our siblings and we like spending time together as a family. Our kids are only 5 and 8 so I appreciate the words of wisdom in the hopes that they will continue being good friends. Love this and will share with families in my church. You are so gifted!